Do you have a toddler/preschooler? Do they seem to have the ability to zero in on exactly which one of Mommy's buttons she doesn't want pushed at any given moment? You're not alone! So here is our current situation... I'm behind on school work (what else is new? ), the house is a WRECK, and my shoulder is out of commission. I have no idea what I did to it, but I can barely move it! And it's my left shoulder. I'm left handed! While I'm trying to take notes and write papers, I'm in excruciating pain. Anywho, with my nerves shot and so many stressors on my mind, the first thing out of my mouth has been "No!" all too often lately! I honestly just have to take a deep breath and think about what I'm saying or requesting. Is it a fair no? Am I asking too much of a three year old? When I make a request or a rule, I want to do it with INTENTION! To me this means having valid reasons and owning my words. And by valid, I mean something other than "it's annoying" or "I don't have time" or "my patience is already worn too thin". You see, if I save my "no's" for times when I really legitimately need them, they carry much more meaning and I can really stick to them! If I say no for every little thing Reagan does during trying times, the seriousness and intent wears off and I'm probably going to recant it when I realize I wasn't really being fair. This is something I personally need a lot of work on and I struggle with daily. Especially in times like these when I'm feeling kind of stuck and useless and literally hurting. I can see the effect it's had on Reagan's behavior after just a few days, and I'm not happy about it. The girl has been quite sassy lately! The good news is that even if you slip up for a few days or you've never been intentional in your parenting before, you can start now. You can get back on track! Set good limits with reason and your kids will thank you for it. Being intentional and letting go of the things that I should not be trying to control honestly brings me a sense of peace. Y'all, peaceful mommy is SO much happier than tense mommy, and so is her little one!! Here is my goal for the next couple days: don't say no unless you really mean it. If Reagan is having fun and it's not hurting anyone or anything, just let her be and let it go, even if it's not exactly what I want her to be doing at the moment or the decibel level I'm looking for. I'll be talking about intentional parenting and intentional living plenty more because it's something I believe in so firmly and it has really blessed my family. 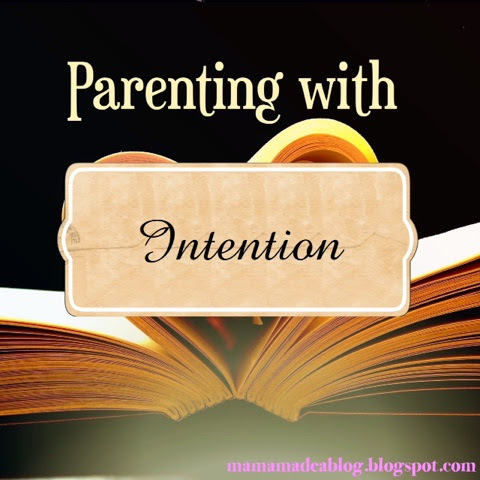 How do YOU parent with intent? Comment or send me an email! If you enjoyed this post, pin it, share it, and follow for more! I'd love to hear from you! Thanks for stopping by! !